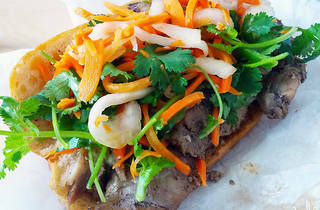 The perpetual line snaking down the sidewalk is testament to the authentic fare at this Little Saigon hole-in-the-wall. The decor is sparse and the menu is short: Banh mi ga (roast chicken), thit (roasted pork), xiu mai (meatball pork), cha lua (pork paté) or tofu, each for under five bucks. Meat-lovers opt for the special combination thit cha paté, which is heaped with chicken, pork loaf and pate. 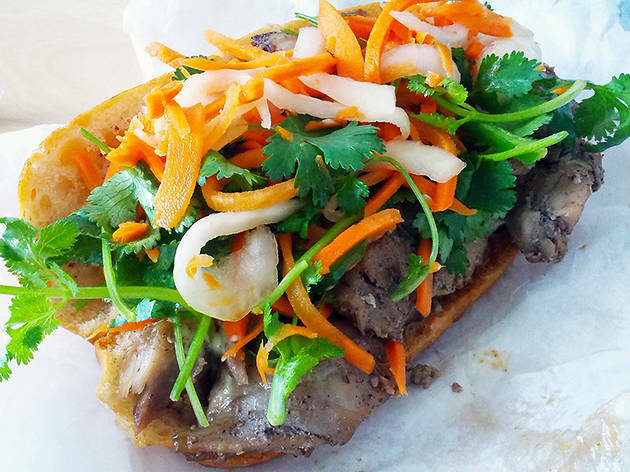 All sandwiches are piled with pickled carrots and daikon, cilantro and jalapeños. There are only two cursory seats in the whole shop, so make like a regular: get your sandwich to go and eat it quick, while it's still warm.